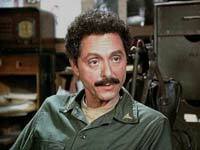 Many people recognize the name Allan Arbus for his role in the popular TV program M*A*S*H. However, he had a previous career as a photographer for the United States Army. His photography career, along with Diane Arbus, his wife who was also a photographer, was modestly successful. Allan Arbus was born in New York City on February 15, 1918, to mother Rose Goldberg and his father, Harry Arbus, a stockbroker. Allan graduated from DeWitt Clinton High School in the Bronx, where he first developed his love for acting when he appeared in a student play. In 1937, Arbus met Diane Nemerov and married her after four years. They had two children, Amy and Doon. The couple separated in 1959 and stayed separated for 10 years before getting a divorce. In 1977, Allan married actress Mariclare Costello and had one daughter, Arin Arbus. During the 1940s, Allan Arbus became a photographer for the United States Army. After getting married to Diane, his father-in-law asked him to do an advertising campaign for a department store that he owned. His experience in taking photographs in the army gave him the confidence and the technical expertise in producing some attractive advertising photographs for his father-in-law’s store. His wife, Diane also helped him in his photographic shoots and enjoyed it very much. Seeing the results and Alan’s craftsmanship, Diane asked Alan to teach her photography. He did so, and together they set up their own photographic studio. Diane took every opportunity to learn the trade from her husband as she was intrigued by Alan’s photographic techniques. Apart from taking advertising photographs, the couple also took fashion photographs and soon found that their works were being published in the pages of Harper’s Bazaar. Many of the photographs that the two too were displayed in a photo exhibition – The Family of Man – organized by Edward Steichen. This display gained a lot of recognition for them and made them popular. In 1956, Alan went in a different direction went on to develop her unique style of photography. Although Alan showed himself as a brilliant photographer, he gave up his career on photography and concentrated on acting in the year 1969. Allan Arbus made his first role on-screen in a film named Hey, Let’s Twist in the year 1961. He also did roles in The Omen II, Putney Swope, WC Fields and Me, Cinderella Liberty and others. Arbus moved on to television during the 1980s and appeared in various hit series like Starsky and Hutch, Hawaii 5-O, Wonder Woman, and The Rockford Files. He also appeared in the famous TV series M*A*S*H.
Allan is survived by his actress wife, Mariclare Costello, and their daughter, Arin, as well as two kids from his first marriage. He died in Los Angeles on April 19, 2013, due to congestive heart failure.